I am interested in understanding the causes, mechanisms and impacts of climate change on decadal to millennial timescales. I use a range of sedimentary and geochemical proxies in marine sediment cores, with a particular emphasis on reconstructing past changes in the circulation of the North Atlantic. D.J.R. Thornalley, D.W. Oppo, P. Ortega, J.I. Robson, C.M. Brierley, R. Davis, I.R. Hall, P. Moffa-Sanchez, N.L. Rose, P.T. Spooner, I. Yashayaev & L.D. Keigwin (2018). Anomalously weak Labrador Sea convection and Atlantic overturning during the past 150 years. Nature, https://doi.org/10.1038/s41586-018-0007-4. M.M. Ezat, T.L. Rasmussen, D.J.R. Thornalley, J. Olsen, L. Skinner, B. Hönisch, & J. Groeneveld (2017). Ventilation history of Nordic Seas overflows during the last (de)glacial period revealed by species-specific foraminiferal 14C dates. Paleoceanography, 32, 172–181, doi:10.1002/2016PA003053. J. Yu, L. Menviel, Z. Jin, D.J.R. Thornalley, S. Barker, G. Marino, E.J. Rohling, Y. Cai, F. Zhang, X. Wang, W.S. Broecker 2016. Deep Atlantic carbon sequestration and atmospheric CO2 decline during the last glaciation. Nature Geoscience doi:10.1038/NGEO2657. Hoogakker, B., Thornalley, D.J.R., Barker, S. 2016. Millennial changes in North Atlantic oxygen concentrations. Biogeosciences, 13, 211-221, doi:10.5194/bg-13-211-2016. Ninnemann, U.S., Thornalley, D.J.R. 2016. Recent natural variability of the Iceland Scotland Overflows on decadal to millennial timescales: Clues from the ooze. US Clivar Variations, 14 (3), 1-8. Blaschek, M., Renssen, H., Kissel, C. & Thornalley D.J.R. 2015. Holocene North Atlantic Overturning in an atmosphere-ocean-sea-ice model compared to proxy-based reconstructions. Paleoceanography, doi: 10.1002/2015PA002828. Thornalley, D.J.R., Bauch, H.A., Gebbie, G., Guo, W., Zielger, M., Barker, S & Skinner, L. 2015. A warm and poorly ventilated deep Arctic Mediterranean during the last glacial period. Science, 349, 706-710. P. Moffa-Sanchez, I. R. Hall, D.J.R. Thornalley, S. Barker, C. Stewart 2015. Changes in the strength of Nordic Seas Overflows over the past 3000 years. Quat. Sci. Rev. 123, 134-143. Thornalley, D.J.R. 2015. Reconstructing Deglacial Circulation Changes in the Northern North Atlantic and Nordic Seas: Δ14C, δ13C, Temperature and δ18OSW Evidence. Nova Acta Leopoldina, NF 121, Nr. 408, 223-228. Stephen Barker, James Chen, Xun Gong, Lukas Jonkers, Gregor Knorr, David Thornalley 2015. Icebergs were not the trigger for North Atlantic cold events. Nature, 520, 333-336. Bakker, P. , A. Govin , D.J.R. Thornalley , D. M. Roche , H. Renssen 2015 . The evolution of deep-ocean flow speeds and δ13C under large changes in the Atlantic overturning circulation: Toward a more direct model-data comparison . Paleoceanography , 30 , 95 – 117 . Moffa Sánchez, P., Born, A., Hall, I.R., Thornalley, D.J.R., Barker, S. 2014. Solar forcing of North Atlantic surface temperature and salinity over the past millennium. Nature Geoscience 7, 275-278. Moffa Sánchez, P., Hall, I., Barker, S., Thornalley, D.J.R., Yashayaev I. 2014. Surface ocean changes in the Eastern Labrador Sea during the last millennium. Paleoceanography, 29 , 160 – 175. Griffiths, J., Barker, S., Hendry, K., Thornalley, D.J.R., van de Flierdt, T., Anderson, R. & Hall, I. 2013. 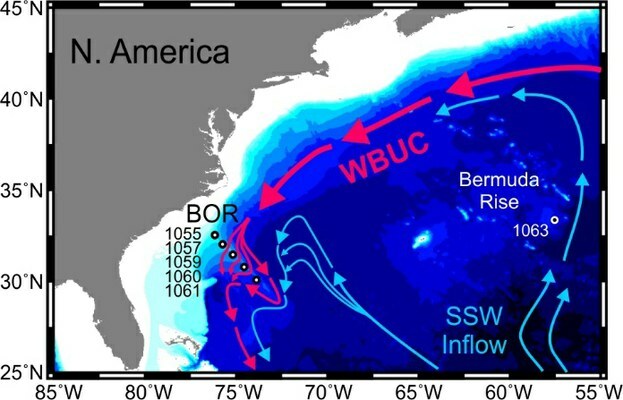 Evidence of silicic acid leakage to the tropical Atlantic via Antarctic intermediate water during Marine Isotope Stage 4. Paleoceanography, doi:10.1002/palo.20030. Thornalley, D.J.R., Blaschek, M., Davies, F.J., Praetorius, S., Oppo, D.W., McManus, J.F., Hall, I.R., Kleiven, H., Renssen., H. & McCave, I.N. 2013 Long-term variations in Iceland-Scotland overflow strength during the Holocene. Climate of the Past, 9, 1627-1656. Yu, J., Thornalley, D.J.R., Rae, J., McCave, I.N., 2013. Calibration and application of B/Ca, Cd/Ca and d11B in Neogloboquadrina pachyderma (sinistral) to constrain CO2 uptake in the subpolar North Atlantic during the last deglaciation. Paleoceanography, 28, doi:10.1002/palo.20024. Thornalley, D.J.R., Barker, S., Becker, J., Knorr, G. & Hall, I.R., 2013. Abrupt changes in ocean circulation during the onset of full glacial conditions. Paleoceanography, 28, doi: 10.1002/palo.20025. Thornalley, D.J.R., Barker, S., Broecker, W.S., Elderfield, H. & McCave, I.N., 2011. The deglacial evolution of North Atlantic deep convection. Science, 331, 202-205. Thornalley, D.J.R., Elderfield, H. & McCave, I.N., 2010. Intermediate and Deep Water Paleoceanography of the northern North Atlantic over the last 21,000 years. Paleoceanography, 25, PA1211, doi:10.1029/2009PA001833. Thornalley, D.J.R., McCave, I.N. & Elderfield, H., 2010. Freshwater Input and Abrupt Deglacial Climate Change in the North Atlantic: Paleoceanography, 25, PA1201, doi:10.1029/2009PA001772. Thornalley, D.J.R., Elderfield H. & McCave, I.N., 2009. Holocene Oscillations in Temperature and Salinity of the Subpolar North Atlantic: Nature, 457, 711-714. McCave, I.N., Kiefer, T., Thornalley, D.J.R. & Elderfield, H., 2005. Deep Flow in the Madagascar-Mascarene Basin Over the Last 150,000 Years: Philosophical Transactions of the Royal Society of London A, 363, 81-99. During the late Quaternary, the Earth’s climate system has undergone climate oscillations on a range of timescales, from multi-decadal processes to glacial-interglacial cycles occurring every ~100,000 years. Changes in ocean circulation played a significant role in these climate events by altering the global redistribution of heat, dissolved nutrients and carbon. My research focuses on constraining how the circulation of the ocean changed in the past and the mechanisms by which these changes affected the global climate system and marine ecosystems. I use a wide range of tools including: faunal assemblage, isotope and elemental ratio (e.g., Mg/Ca, B/Ca, Cd/Ca) analysis of foraminifera to reconstruct water mass properties; geochemical proxies of circulation such as measurement of Pa/Th ratios, Nd isotopes and radiocarbon concentrations; examination of the detrital components of sediment such as ice-rafted detritus and geochemical analysis of tephra for improving stratigraphy; sediment grain size analysis (e.g. sortable silt analysis) to reconstruct relative changes in paleo-current strength; and fluxes and composition of organic matter to the seafloor, combined with benthic faunal assemblage to investigate marine ecosystem changes. Deep water produced in the high latitude North Atlantic forms a deep western boundary current (locally termed the Western Boundary Undercurrent, WBUC) that flows southward, at depth, along the eastern margin of North America. The WBUC plays an important role in rapidly transmitting climate signals into the ocean interior and helping ventilate the world’s ocean. I am using grain size analysis to examine how the flow speed structure of the WBUC altered between warm and cold climate intervals throughout the last glacial period and the Holocene (Figure 1). This work is also coupled to isotope ratios and element ratios in benthic foraminifera to determine changes in circulation patterns. The formation of cold, dense water in the North Atlantic plays a critical role in the global thermohaline circulation, and the compensating inflow of Atlantic surface waters helps warm NW Europe. Using grain size data from cores taken south of Iceland and off Cape Hatteras, I am investigating the strength of the deep components of the Atlantic thermohaline circulation throughout the Holocene (~0-11,000 years ago), examining likely controls and effects and its link with broader climate variability. With collaborators from WHOI, we collected new cores on a cruise in May 2014. These cores are being used to examine changes in the overflows over the past 2000 years, focussing on whether or not there have been any changes between the Little Ice Age and the present day. The termination of the last Ice Age was accompanied by abrupt changes in ocean circulation. The Northeast Atlantic and Nordic Seas in particularly were subject to dramatic reorganisations that are thought to have had an impact on global climate evolution through this period. I am calibrating and using elemental ratios in benthic foraminifera to constrain changes in the physical and chemical properties of the Northeast Atlantic and Nordic Seas. I am also using benthic radiocarbon dating to help constrain the ventilation of this oceanographic region since the last glacial. Figure 2. 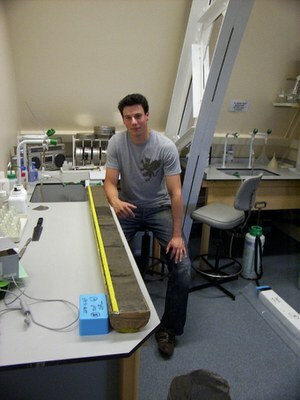 A sediment core from south of Iceland. Ongoing work involves correlating volcanic ash layers (black layers) in the cores to similar ash layers found in Greenland ice cores to help determine lead-lag relationships between different climate archives. Measuring the elemental ratios in foraminifera (microscopic, single-celled organisms), found within the core, can also be used to reconstruct the past physical and chemical properties of the ocean and determine its role during past climate change. The strength of the North Atlantic’s subpolar gyre varies on annual to millennial timescales and it is likely involved in feedback mechanisms that impact atmospheric circulation and the overturning circulation of the ocean. In collaboration with scientists from Cardiff University, we are investigating how the circulation of subpolar gyre changed on decadal timescales throughout the last 2,000 years, as well as investigating millennial scale changes throughout the Holocene. As part of the EU Atlas project (http://www.eu-atlas.org/) my research group is investigating the potential impact of recent Atlantic circulation changes on deep sea ecosystems and marine resources. My work over the last 5 years has been focussed on understanding the role of the North Atlantic in abrupt climate change. This work has revealed unexpected variability in the properties of both the surface and deep ocean, resulting in publications in Nature and Science, which have been reported on by NERC Planet Earth as well as the wider public media. I was recently (2016) awarded a Philip Leverhulme Prize in Geography, which "recognizes the achievement of outstanding researchers whose work has already attracted international recognition and whose future career is exceptionally promising". 2017-present: Alice Carter-Champion, Investigating the drivers and responses of climatic complexity during the Younger Dryas (Co-supervisor). 2017-present: Paul Minton, Middle to late Miocene climate variability and biotic response: a high resolution record from Integrated Ocean Drilling Program (IODP) (Co-supervisor). 2013-present: Rehemat Bhatia, Geochemical signals in greenhouse and icehouse planktonic foraminifera (Co-supervisor).